Steve Woltmann | Loyola Athletics Colin Mahan goes up for a kill. 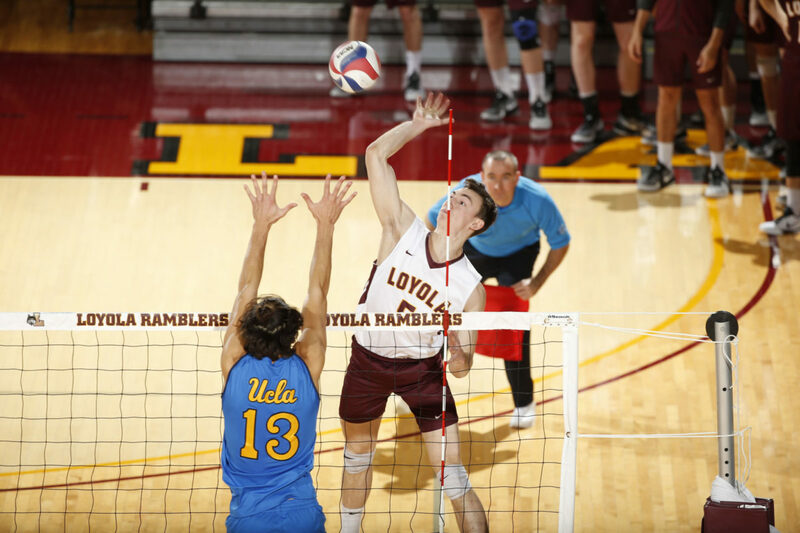 After finishing last season off strong as Midwestern Intercollegiate Volleyball Association (MIVA) co-regular season champions and ranked seventh nationally with a record of 23-7, the Loyola men’s volleyball team looks to continue its success and seeks a hot start to open the season. Head coach Mark Hulse said the team’s seven first-years can have an immediate impact this season. Although this is the first year with zero players from the 2015 national championship team, Hulse said the young guys on the team have an excellent feel for the game and should contribute right away. Hulse said the young Ramblers already show great potential and he expects them to continue to improve their game while at Loyola. Loyola has had success in previous seasons — winning national championships in 2014 and 2015. But, according to senior libero Avery Aylsworth, the team stresses the importance of not resting on its laurels. Aylsworth said each season is a fresh start and he looks forward to seeing this team’s potential. Hulse said the Ramblers’ energy is focused toward starting this season off strong and constantly finding ways to improve. Hulse said the early games in the season, such as against University of California, Irvine, which was sixth in the nation last season, will be difficult. Hulse said he expects the team to start off strong and thinks the players are up for the challenge. “We’re going to play the best teams that we can play and so if we are resting on our laurels, they have laurels too,” Hulse said. Aylsworth said he’s looking forward to the season’s open and expects the team to play with great intensity. He said it’ll be important to come out of the gate strong and to be the best they can be right off the bat. With the hiring of new associate head coach Matt McCarthy, senior outside hitter Collin Mahan said the players have elevated their efficiency and worked to improve upon their offensive and defensive schemes. He’s seen major improvements through the players’ ability to continue to work at the offensive schemes from last year, Mahan said. He added the goal for right now is to catch the young players up on Hulse’s system to ensure everyone is firing on all cylinders. Aylsworth and Mahan both said they’ve seen a lot of potential in this year’s seven newcomers and expect them to contribute to winning right away. Hulse said the entire team is excited for the season and the players are all working hard to improve upon the success from last season.